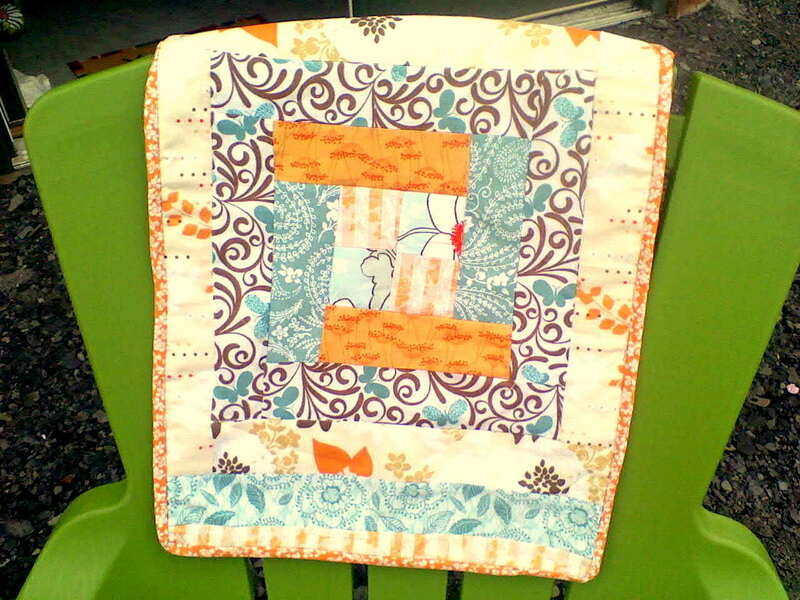 Sew Much To Say: Multi-Purpose Baby Gift. 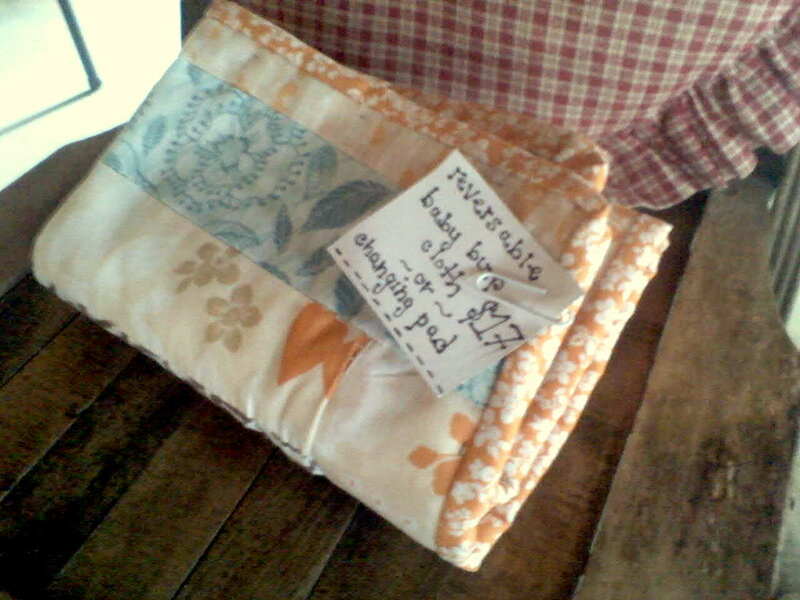 Here is my very first, wrapped up, baby burp cloth and changing pad! I made it all last night for my mom to give to her friend as a baby gift and I absolutely love how it turned out. I love the colors and how well they work today. I'm completely in love with using jelly rolls now. I've been telling Alec and my Mom to have people get me them as gifts when they don't know what to get me for Christmas but, still feel obliged to get me some small gift. That is how much I love them. 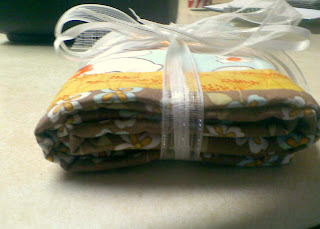 Jelly Rolls are so handy because they are all pre-cut and ready to roll. 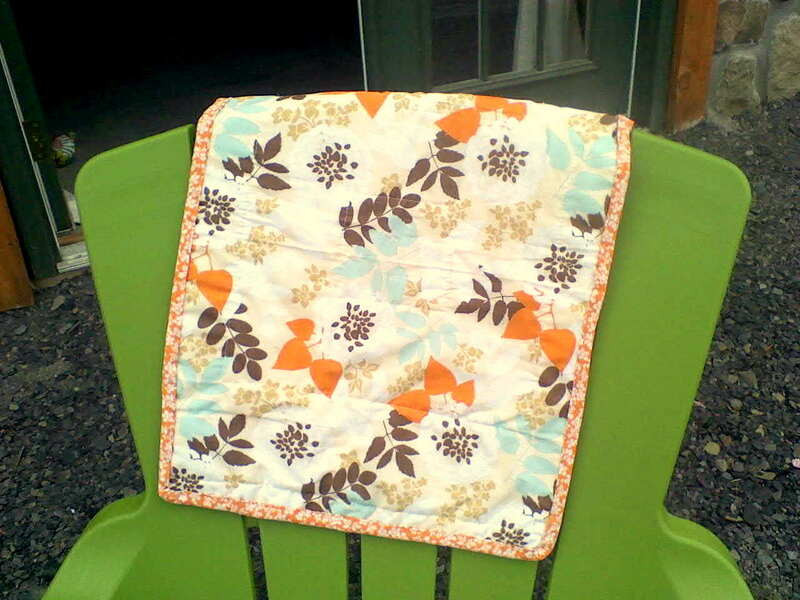 It makes for a quick and easy sewing time. 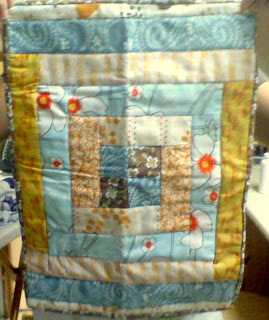 Here is the front of it; I know it is wrinkled looking but, that is because it was folded up before the picture. 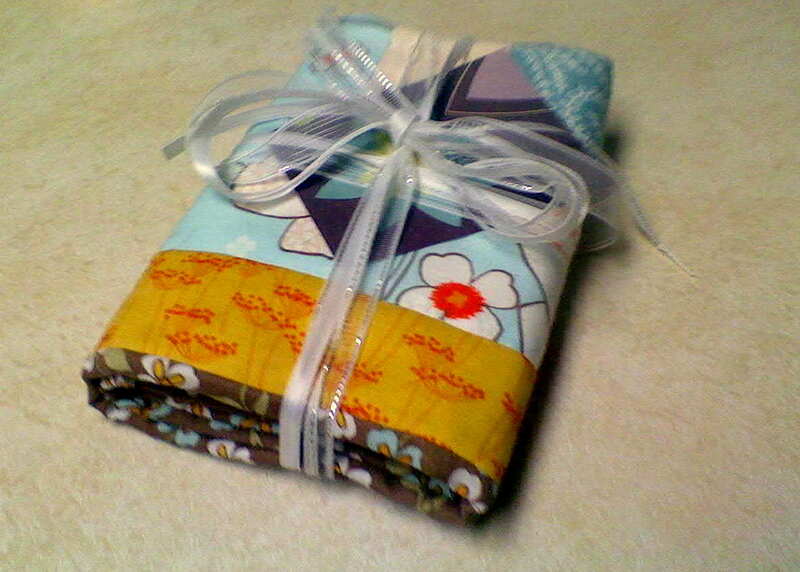 Here is the fabric I used on the back of it. I love how it looks like a bandanna. 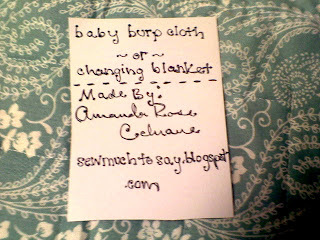 This is the card I put with it. I made it out of some basic scrapbook paper. I loved making it so much that I made another one before work this morning. I'm still trying to get a handle on the block technique so the corners lay flat. 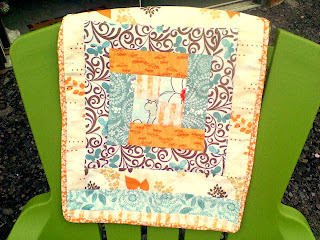 The satisfaction of completing a project is really great, especially when it only takes a few hours from start to end. 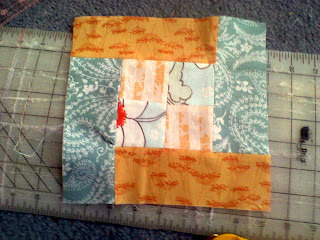 Here is the very center of the block. 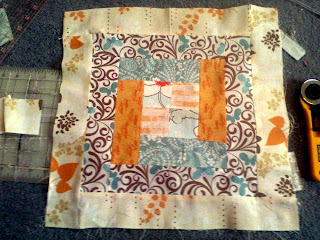 I added on one fabric as a border outside of the block. I know this looks like the same fabric on all sides but the top and bottom are actually different than the sides. Like I said, I love love this fabric and the colors. Here is my second one all bonded and laying out on a lawn chair at work today. I finished just in time to take it with me to work where I could stitch the binding. 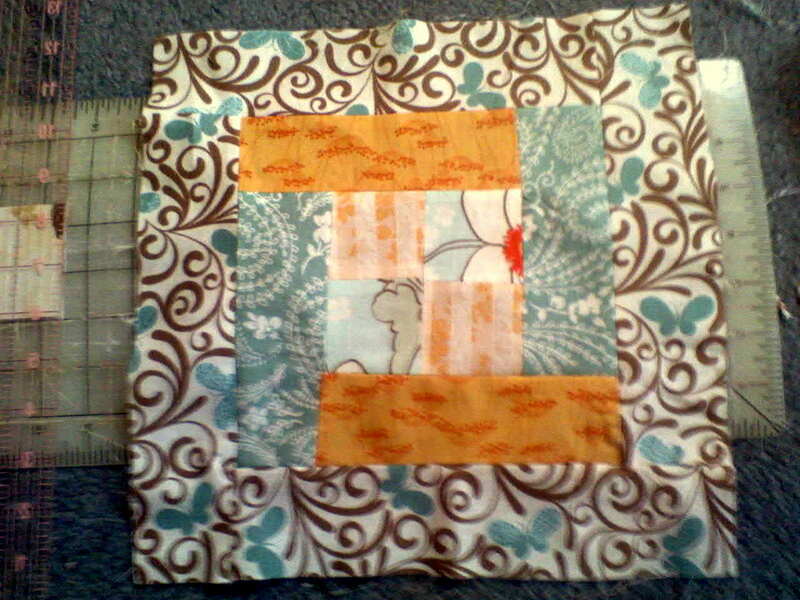 This is the back fabric. 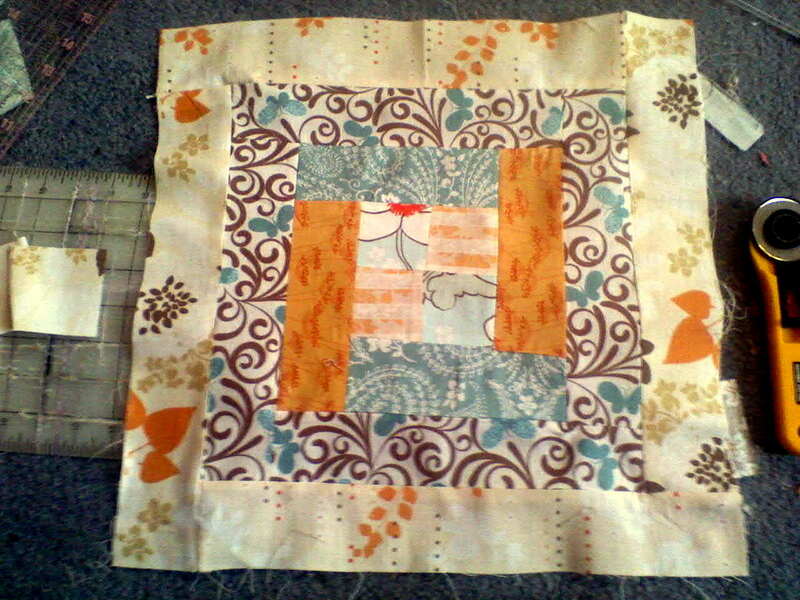 I like this one even better than the first, Now that I have most of the kinks worked out. When I make a mistake it doesn't really bother me. I think it gives it the homemade feel. I put the second one at the store to see if anybody would be interested in buying it. 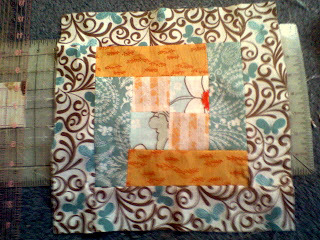 I made it its own little tag, too. If anybody wants to buy one let me know! Did you really make these?! They are soo cute! Your blog is so amazing i really like it! we should follow eachother!